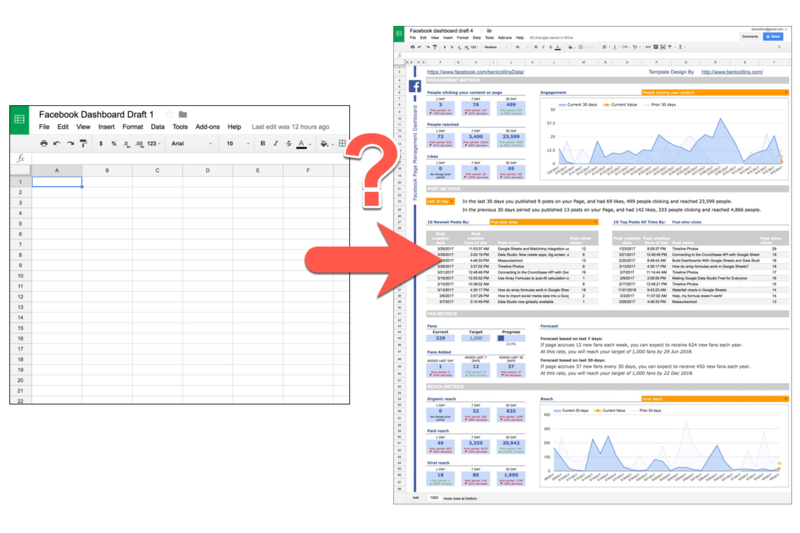 You start with a blank canvas, or a blank Google Sheet in this case, and you have to somehow turn that into business insights, which will grow your bottom line, make your organization more efficient or help you understand your customers better. 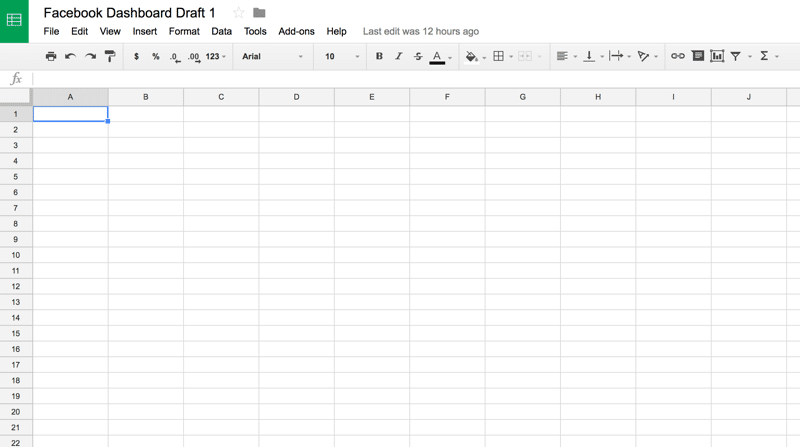 Notice the blank sheet is Draft 1 and the final dashboard is Draft 4. It’s an iterative process. Click to open larger image in new browser tab. Want your own copy of this Facebook dashboard? The blank screen stares back at you, waiting for you to do something. You clasp your hands around the back of your head, lean back in your chair and rue the day you mentioned building a dashboard to your boss. It was supposed to be easy. Easy to create a masterpiece, a thing of beauty to wow your team. Meanwhile, that blank Sheet continues to stare back at you, emptier than ever. Have you ever wanted to improve your reporting in Google Sheets? Or create dashboard reports that are both beautiful and functional? 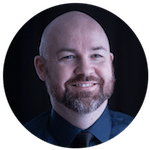 Build Business Dashboards With Google Sheets and Data Studio, my new online course, launches today. This is a comprehensive, online course that will teach you all the key techniques for building beautiful, interactive dashboards with Google Sheets and Google’s new visualization tool, Data Studio. 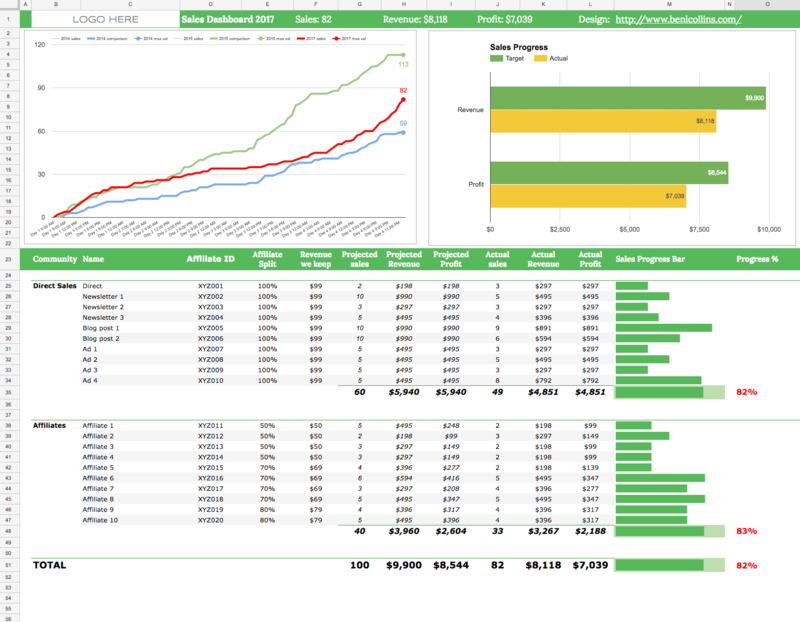 Dashboards are fantastic tools that give you a high-level view of your business, showing KPIs, trends and data comparisons. Showing the growth of your website or clients’ websites, by tracking traffic and social media metrics over time. Understanding your business better by collecting and analyzing user data in real-time. Comparing sales data across different time periods, sales channels or geographic regions to get deeper insights into your opportunities. Measuring student attendance and performance to easily see where to allocate resources. Tracking and visualizing financial data to uncover high- and low-performing areas of your company, so you can make adjustments going forward. By learning some relatively simple techniques, you can create dashboards that are automated, interactive and visually appealing. They’ll get people’s attention and wow your colleagues and bosses. 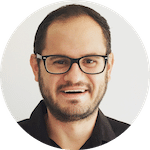 This course covers everything you need to know about building beautiful business dashboards with Google Sheets and Google Data Studio. This course is dashboard-focused and entirely practical. Concepts are taught through real-life examples, starting with a basic static dashboard all the way through to the complex web marketing dashboard you can see in the screenshot above. The course covers data visualization and dashboard best practices, dynamic dashboards, how to use Google Forms to collect data, how to import external data, how to use Apps Script to automate processes and add extra features, Google’s new dashboard tool, Data Studio, and much, much more. > Over 9 hours of video content. > Lifetime access to all the content, to learn at your own pace. > Copies of all the finished dashboard templates for the five dashboard examples and the one Data Studio report. > Access to all the raw data files, copies of the formulas and links to online documentation and other great resources. > Membership to our dedicated Facebook group where you can post questions and get answers, share insights and interact with other students. This course is a fantastic way to discover how to build dashboards. Ben takes you step by step through what you need to do and his approach is well thought and organised. The information covers the basics and introduces more complex subjects in a simple and easy to follow format. Any other questions? Leave a comment or drop me a line here. Google launched a new business intelligence tool called Data Studio in May 2016. 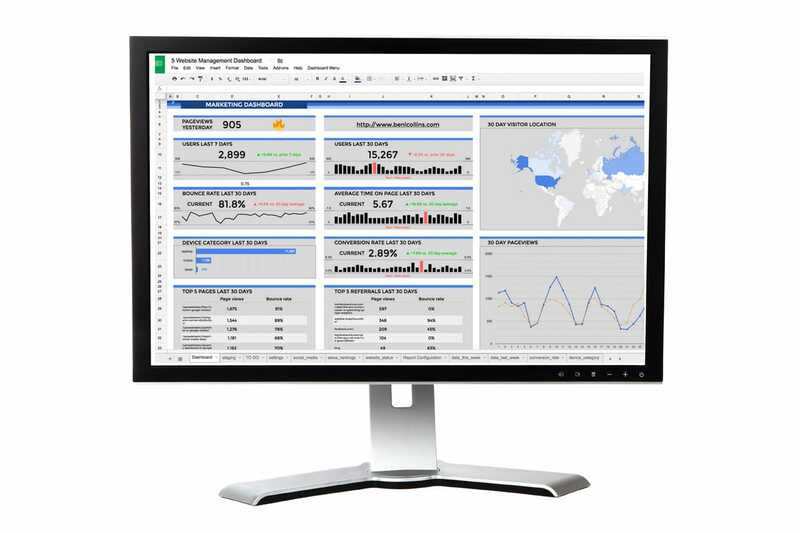 It’s a really smart reporting tool for quickly creating powerful, stunning dashboards from multiple Google data sources. It’s a great option for small/medium businesses already using Google tools, who want to build bespoke dashboards for that 40,000ft view of their business. Here are two example reports for a mid-size website (~500k pageviews a month).